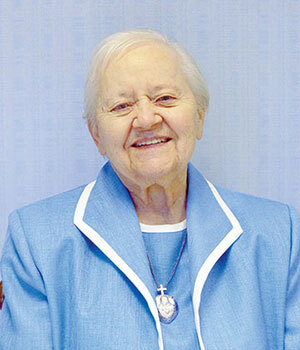 In honor and celebration of Sister Stella, we share her story. 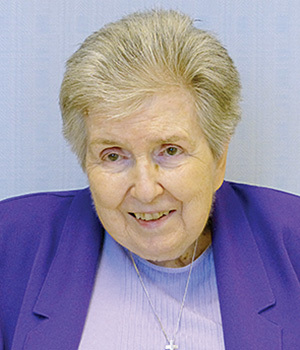 It is not easy to consign to a page the life of a Sister of the Holy Cross, let alone 99 years of the life of Sister Mary Stella. In the olden days she wore a religious habit of black and white. Oh yes, there was a blue cincture about the waist to add a bit of color, but “a nun’s life” was mostly black and white. Or to put it bluntly, Sister Stella led a rather colorless life when compared to the newsmakers of her times. So it might seem. Rose Thelma Haske was born in Washington, D.C., on May 21, 1917, in the midst of World War I—initially known as The Great War, journalists thinking this was the war to end all wars. Her parents, John and Rose Haske, owned and operated Haske’s Bakery where the young Rose herself helped out occasionally. 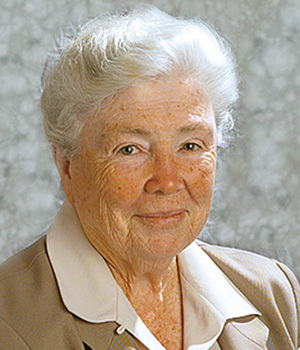 She first met the Sisters of the Holy Cross during her high school years at Saint Paul’s Academy in Washington, D.C. She loved the sisters who taught her, and a religious vocation eventually stirred in her. 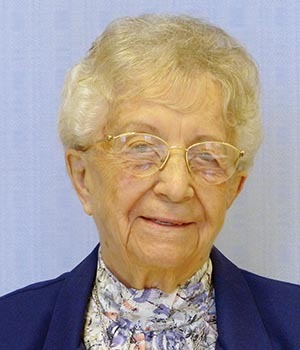 Rose entered the Congregation of the Sisters of the Holy Cross from Washington, D.C., on July 27, 1937, at 20 years old, having been a telephone operator and office worker. She lived through some of the worst years of the Great Depression. 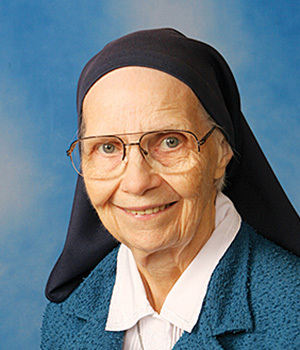 On February 2, 1938, she received the holy habit and her name in religion, Sister Mary Stella. Adolf Hitler’s Brown Shirts in Germany were tapping into the resentment resulting from the defeat in World War I and the debt incurred by the war reparations. By August 15, 1943, when Sister Stella was perpetually professed, the United States was deep into the global war known as World War II. Every life is a great mystery to ponder. 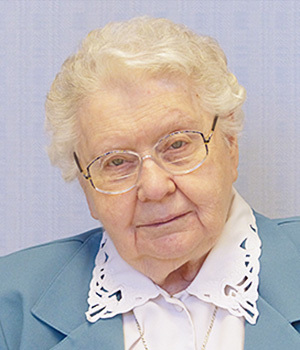 In the grand scheme of things, consider the contrast as one looks backward over the life of Sister Stella, even before she ever went on mission. Within the same time frame, on one continent lived a young Adolf Hitler who aspired to be the greatest artist of all time. In his twenties he had already been rejected admission to an art school and was a veteran of trench warfare. Adolf Hitler tried to survive by selling his paintings and tinted postcards on the streets of Vienna. On another continent—in the same decade—was a little girl, Rose Haske, at Saint Mary’s Parish Elementary School in Washington, D.C. She loved to draw and paint and was often praised for her artistry. Eventually she became a Sister of the Holy Cross and was trained in art education. Two would-be artists. Both ached to express themselves through art. One chose death. The other chose life. Sister Stella was not a great historical figure, whether in American history or in the annals of the Sisters of the Holy Cross. She was invisible—except to her family, friends, community, and those to whom she ministered. She was discreet. She did not make a fuss. She did not cause trouble. She was polite. 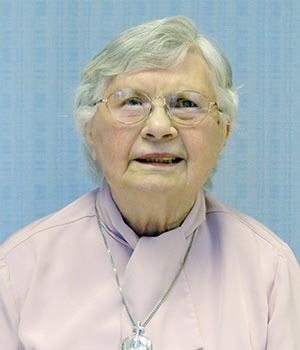 There is no greater accolade in Holy Cross than to describe the likes of Sister Stella as “a caring and prayerful woman of faith” devoted to family and community. And that she was. Furthermore, “she was a hard worker who gave 100 percent to everything she did.” All that is rather standard for being a Sister of the Holy Cross. That is why it is so hard to pull together a memento such as this when we sisters tend not to be newsmakers, movers and shakers. That which mattered most to Sister Stella was not being a headliner. Despite the fact that her name in religion is Latin for “star,” Stella never angled for star power or celebrity. 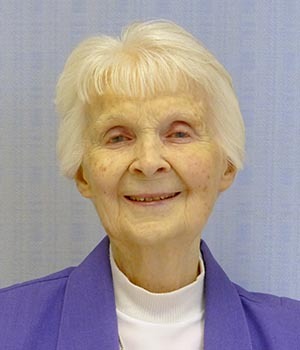 She was kind and loving to children and taught all the elementary grades. Sadly, young people today feel like failures if they do not become famous. Hence their need to overcome anonymity. Teachers like Sister Stella made each child feel noticed and special. She celebrated their gifts, their colors, their creativity. That sense of creativity colored her ministry as an elementary school teacher and administrator in schools in her native Washington, D.C., as well as in Virginia, Maryland, Pennsylvania, New York and Texas. We are not sure if Stella allowed herself to color outside the lines, but we know her educational methods included projects, choral reading and poetry. Her love of God was apparent to her students with whom she shared a sense of wonder. Both students and teacher played in the beauty of God’s nature and creation. We know when she first came to Saint Mary’s in 2001 she was a determined walker, so much so that she wore out her companions. In her mind’s eye she may have been remembering her Moreau Pilgrimage in the 1980s, a journey that took a lot of physical stamina, but which she cherished for giving her the opportunity to meditate on Christ’s life as well as that of Father Moreau. That pilgrimage deepened and strengthened her prayer life. 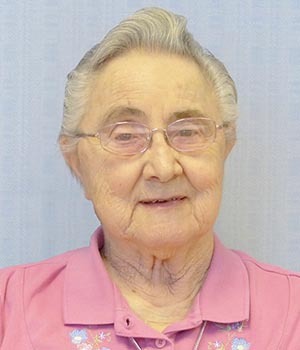 But Sister Stella described herself as “plodding along” in her relationship with Jesus Christ, yet always “getting there!” She no longer walks The Avenue. She has not been across the highway for a very long time to visit The Grotto. Nor have the halls of Saint Mary’s Convent heard her slower footfall for quite some time. But my, oh my! Stella has taken a long walk into the autumn woods. Winter is near but the colors are magnificent!